Five members of the Zepeda family stood together in the sunlight streaming through the open door of a warehouse near the San Luis Obispo County Regional Airport. Andy "Papa Bear" Zepeda wore a black shirt with a bear paw in its center imposed over bands of Rastafarian red, yellow, and green. Shay Zepeda, his son, wore a matching shirt. They decorated the empty warehouse that the San Luis Obispo County Board of Supervisors had recently approved for their cannabis business with a black flag depicting the same logo bordered by two phrases: "Papa Bear" above the paw; "Fine Cannabis" underneath. "We really are family unit," Papa Bear said. "It's as small business as it gets." 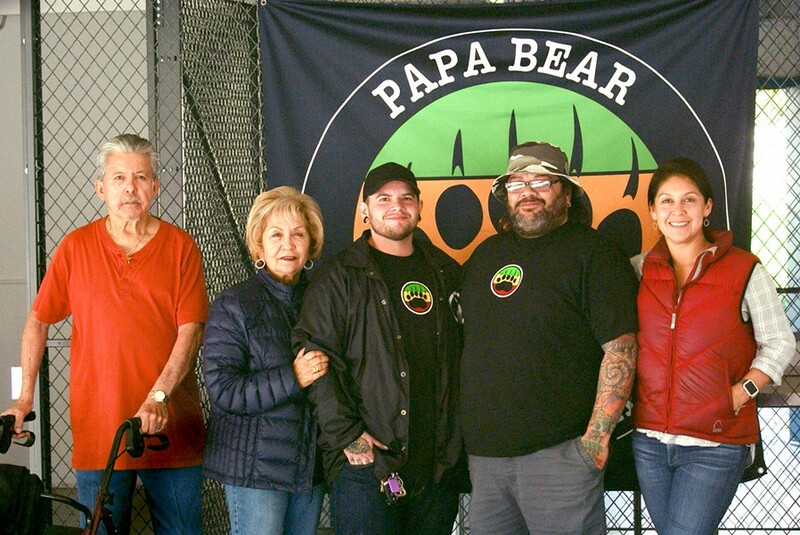 FAMILY BUSINESS Alfred Castaneda, Irene Castaneda, Shay Zepeda, Andy "Papa Bear" Zepeda, and Rachel Salerno are getting ready to start Papa Bear's Fine Cannabis and Better Living Delivery in SLO County. Papa Bear's plan to launch his family into the emerging cannabis industry goes beyond a guaranteed 45-minute delivery of cannabis flower and vapes. He wants to combine distribution, manufacturing, and delivery, three aspects of the industry normally split up among three companies, he said. He wants to source oil and cannabis from local cultivators; test them for pesticides, metals, and nutrients; package them in his warehouse with their logos; and deliver them to retail outlets across the state and homes across San Luis Obispo County. Once he gets up and running in April, Papa Bear and his family will dip their fingers into the estimated $22 million cannabis delivery industry in San Luis Obispo County—and the estimated $4 billion statewide distribution market. "I never imagined I would be an investor in something like this," Papa Bear's father, Alfred Castaneda, said. Castaneda spent his life in law enforcement. He was a captain in the California Department of Corrections and Rehabilitation and worked at the California Men's Colony and Wasco State Prison. He said he'd stopped smoking marijuana by then, but he smoked in the 1960s, at a time when high schoolers bought kilos of cheap Mexican weed for $12.50. After years of seeing marijuana as the criminalized counterculture at the center of the county's war on drugs, Castaneda is persistently surprised that it's becoming the family business. Shay grew up in the 1990s with Papa Bear's marijuana growing hidden from him, in the same way parents usually hide alcohol from their children. But he said his father taught him that what he grew could be a medicine for him if he ever got hurt. When practicing basketball in the offseason for an interstate traveling team, he detached his Achilles tendon. The bone scraped away the cartilage in his ankle, and his doctor told him he would never be able to play again. He used different prescribed painkillers, including opioids, until he got his medical marijuana card and stuck with it as it minimized his pain better than the other options. "I'm not a drinker; I don't enjoy a beer or anything like that as much as a joint," Shay said. "But I have a love for it medically as well as recreationally." He is not the only one in the family who sees cannabis as therapeutic. Castaneda uses prescribed marijuana to ease his joint pains, and Papa Bear's sister, physical therapy assistant Rachel Salerno, says her patients use what she calls a cheap non-addictive pain killer that works more efficiently than other prescriptions. "There are such ramifications with taking painkillers. You can get intestinal blocks, the side effects are horrible," Salerno said. "It's just an easier painkiller on your body." Salerno; Castaneda; and his wife, Irene Castaneda, will all work at Papa Bear's Fine Cannabis and Better Living Delivery, the cannabis delivery company Zepeda will run in cooperation with the cannabis distribution and manufacturing business, if all goes to plan by April. Intern Aidan McGloin wrote this week's Strokes & Plugs. Email your hottest business and nonprofit tips to strokes@newtimesslo.com.